Should All the Compulsory General Studies Be a Must? Based on Hanyang University (HYU)’s curriculum from the class of 2017, there are eight to nine compulsory general studies courses during the four school years. The College of Medicine and the Division of International Studies are the only exceptions with the requirement of 19 credits, and an additional nine depending on the major track. 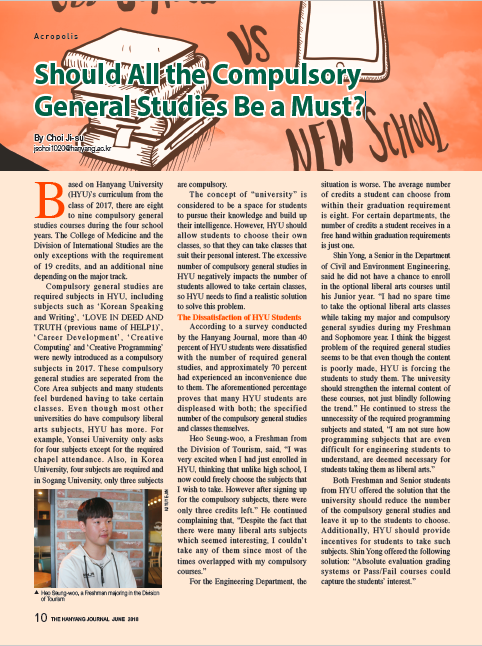 Compulsory general studies are required subjects in HYU, including subjects such as ‘Korean Speaking and Writing’, ‘LOVE IN DEED AND TRUTH (previous name of HELP1)’, ‘Career Development’, ‘Creative Computing’ and ‘Creative Programming’ were newly introduced as a compulsory subjects in 2017. These compulsory general studies are seperated from the Core Area subjects and many students feel burdened having to take certain classes. Even though most other universities do have compulsory liberal arts subjects, HYU has more. For example, Yonsei University only asks for four subjects except for the required chapel attendance. Also, in Korea University, four subjects are required and in Sogang University, only three subjects are compulsory. The concept of “university” is considered to be a space for students to pursue their knowledge and build up their intelligence. However, HYU should allow students to choose their own classes, so that they can take classes that suit their personal interest. The excessive number of compulsory general studies in HYU negatively impacts the number of students allowed to take certain classes, so HYU needs to find a realistic solution to solve this problem. According to a survey conducted by the Hanyang Journal, more than 40 percent of HYU students were dissatisfied with the number of required general studies, and approximately 70 percent had experienced an inconvenience due to them. The aforementioned percentage proves that many HYU students are displeased with both; the specified number of the compulsory general studies and classes themselves. For the Engineering Department, the situation is worse. The average number of credits a student can choose from within their graduation requirement is eight. For certain departments, the number of credits a student receives in a free hand within graduation requirements is just one. Regarding the issue, HYU admitted that there is not much flexibility compared to other universities, but argued that the appropriateness for the number of compulsory liberal art subjects in HYU is a difficult situation to compare with other because every university has different educational goals and systems. Good Classes, TFT’ program, which is comprised of major members of the student council. However, an essential training field with clear educational objectives is not going to be easily abolished unless the purpose of the education is lost. As the mandatory HELP4 was removed last year, there seems to be some positive movements in relation to compulsory general studies. A reorganizational study is currently underway with regards to HELP. Although it is still in the research stage and no decision has yet been made, HYU is trying to ease the burden of students by collecting opinions from students and making comprehensive judgments. “For HELP1 to 4, the improvement of the internal training is on its way, along with time progress,” said You Yeon-tak. HYU should be aware of the complaints that current HYU students have and prevent excessively increasing the number of general studies courses required. Furthermore, it should only be increased after an advanced notice period or after actively communicating with the students.